We Happy Few is out later this week on August 10th, and developer Compulsion Games have revealed what DLC content players can expect to see after the game’s launch. The additional content includes a paid Season Pass, which will include three new stories based around three additional player characters – similar to how MachineGames handled Wolfenstein 2’s ‘Freedom Chronicles’ DLC pass, which saw players take on the roles of Gunsliger Joe, Agent Silent Death, and Captain Wilkins. The developer is also planning on adding an infinite Sandbox Mode to the game as a free update. 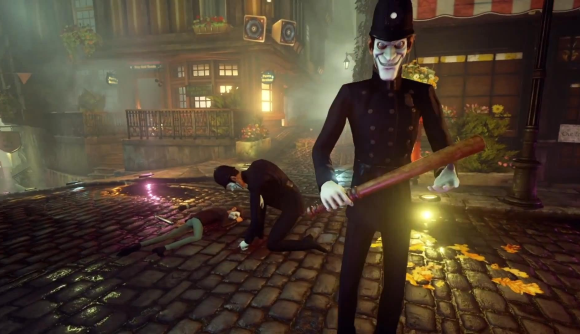 This is designed to play closer to the original systemic style of gameplay We Happy Few showcased in the early days of its design. Players will also be able to customise their sandbox experience to make things harder or easier to play. There will be options to make the randomly-generated world smaller or larger, make less food available, have more people on the street, and more. There’s even an option to play as different characters, including one of the drug-addicted Wellie citizens. Compulsion Games showed all this on their website. While the developer didn’t reveal the price of the Season Pass, they do offer a brief synopsis of each of three new stories, along with their titles – ‘Roger & James in: They Came From Below!’, ‘Lightbearer’, and ‘We All Fall Down’. The Season Pass is currently only available as part of the game’s Deluxe Edition, although the developer do plan to have it available for separate purchase.